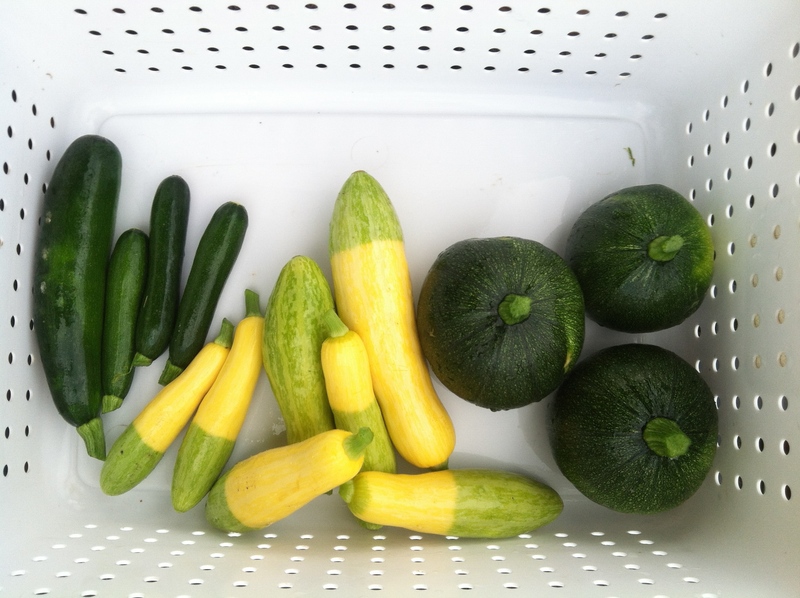 What to do with eight ball zucchini? The squashes are doing great this year, and we have had fun growing some unusual varieties: zephyr (a type of yellow squash that is bi-color: yellow body, green end(s)), lemon (a fun lemon colored and shaped yellow squash), raven zucchini (dark green and delicious) and eight ball zucchini (a small, round zucchini with great flavor). Why grow the same thing as everyone else, is what I think…but new or unusual can raise some important questions like: what do I do with it? How do I eat it? A little help please? Cut zucchini tops off about 3/4 inch from the top. Scoop out the insides, being careful to leave a wall about 1/4 inch thick on all sides. Steam zucchini and tops for about 8 minutes, until slightly softened. Rehydrate the sun-dried tomatoes by soaking them in hot water until softened. Remove from water and chop. Reserve soaking water. Chop the zucchini pulp. Heat a non-stick skillet over medium-high heat, and sauté the garlic for about 1 minute. Add the zucchini pulp and cook for 2 more minutes. Add the tomatoes, brown rice and almonds, and if the mixture seems dry, add a splash of the tomato liquid. Add the basil leaves, Kalamata olives, and black pepper to taste. Cook until warm, about 3 minutes. Preheat the oven to 400 F. Using a spoon, carefully stuff the rice mixture into the zucchini, mounding slightly on top. Place in an uncovered baking dish and bake for 20 minutes. Serve hot, covered with tops if desired. – Added about 1/3 c. finely diced onion, sauteeing it first in a little olive oil. When they were a bit soft I added the garlic. – Used oil-packed sundried tomatoes because that’s what I had. I skipped the “soak in hot water” step and added them when I added the garlic to the onions. I didn’t need any extra liquid, but if I had I probably would have drizzled in some wine. – Used jasmine rice because that’s what I had already cooked in the fridge. – Also added about 1/4 c. finely shaved parmesan after I took it off the heat. Could have even used a bit more. This is a keeper! We have a vegetarian daughter- in- law who will love this dish. Thanks a bunch. No problem. We sold all of ours at market this weekend, so I have to wait until the next harvest to try! Looks delicious. 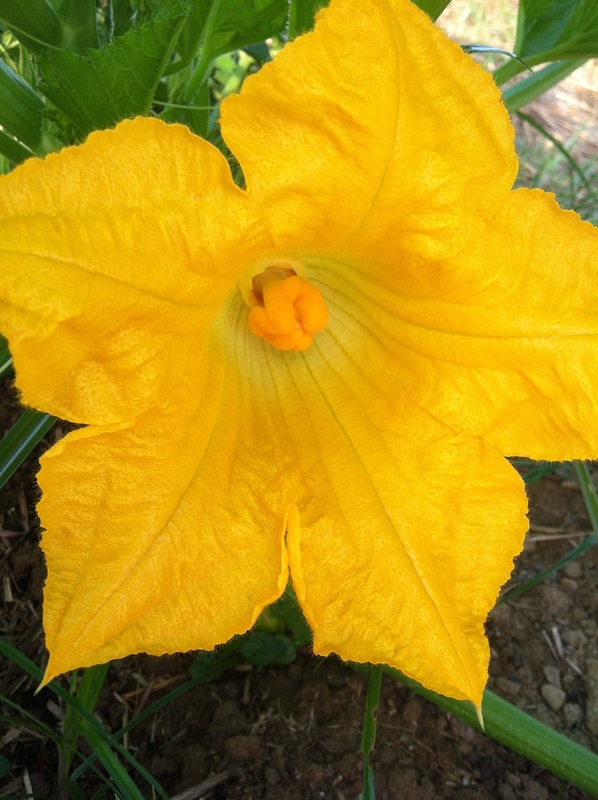 I would make a yellow quash casserole, one of my family’s favorites. The stuffed 8ball zucchini sounds good. I promised Brad I would keep trying it since squash is so good for you.I love the varieties you’re bringing and the recipes. When I walk away with a stash of yellow squash, I’ll share my version of Joyce’s family recipe for squash casserole. DELISH.